Ongoing work at the Kennedy Space Center and Cape Canaveral is continuing to lay the groundwork to once again launch American astronauts from home soil. While the huge Pad 39B equipment enters a critical period of testing at KSC for the Space Launch System, the Crew Access Arm and White Room is scheduled to be installed on the SLC-41 pad in the coming days, in preparation for Starliner missions. Even before Boeing’s progression into 2012’s Commercial Crew integrated Capability (CCiCap) contract with NASA, plans for converting SLC-41 into a dual use pad for Atlas V were being designed. At the time, Atlas V was looking to launch both Starliner (then known only as CST-100) and Dream Chaser crew missions from the Cape Canaveral pad. Dream Chaser was shown in the majority of the envisioning, albeit preliminary views of a crew walking across an exposed platform to board their spacecraft. Unsurprisingly, those pad designs soon evolved. 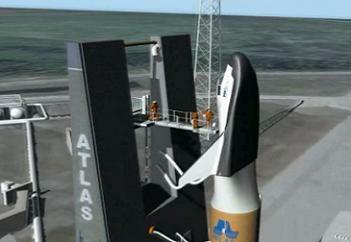 Renderings and videos created by Dream Chaser’s parents at SNC showed a pad that began to include a Crew Access Arm and a White Room in the envisioning, allowing astronauts to complete their final leg to the spacecraft – following an elevator ride to the top of the pad – via an enclosed structure. Although Dream Chaser lost out on launching NASA astronauts from SLC-41, she is expected to launch cargo missions on the Atlas V.
With Starliner effectively beat Dream Chaser to join SpaceX’s Dragon 2 in the honor of launching American astronauts from home soil for the first time since Atlantis’ STS-135 mission, SLC-41 still requires “crew rating”. Originally built for the Titan IIIC and subsequently used by the Titan IIIE and Titan IV before being rebuilt for the Atlas between 1999 and 2002, SLC-41 supports all of the Atlas V’s East Coast launches with West Coast launches making use of Space Launch Complex 3E at Vandenberg Air Force Base. Historically, SLC-41 has seen a share of notable satellite launches, including the Helios probe, the Viking probes to Mars, and the Voyager interplanetary and interstellar deep space probes by Titan rockets, as well as the Mars Reconnaissance Orbiter, New Horizons, Juno, and the Mars Science Laboratory “Curiosity” missions by the Atlas V rocket. Work to convert the pad for its new era of hosting Starliner launches has been ongoing between Atlas V’s bread and butter missions launching an array of spacecraft from her Cape pad. The service tower, designed to provide access to the CST-100 Starliner for pre-launch processing, crew access, and safety egress systems (EES – Emergency Egress System) should the need to evacuate Starliner on the pad occur, was built offsite for transportation to LC-41 in between Atlas V missions. 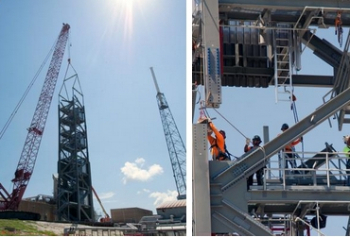 Beginning after the MUOS-3 launch in early 2015, pre-fabricated tiers of the tower were stacked at the pad in April. With all the tiers now assembled – along with the internal structure that includes an elevator – construction at the pad focused on the outboard steel. 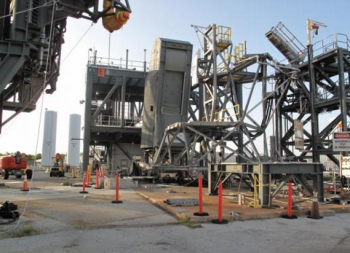 The final major piece of the tower is the crew access arm, tested at the Sauer Group, Inc.’s yard in Oak Hill, Florida, just north of the Cape Canaveral area. It has been transported to the launch site to be installed on the new structure in the coming days. Currently, media are expected to be invited over the weekend to celebrate its installation. 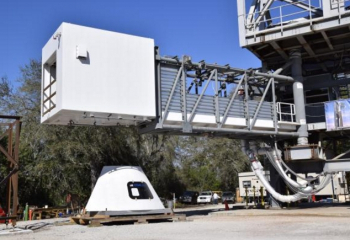 After all, the milestone of installation will complete the major construction of the first new Crew Access Tower to be constructed along Florida’s Space Coast since the Apollo era. The integrated tower is estimated to be complete by mid-October, well before Starliner launches are set to take place in early 2018. While SLC-41 has gained additional structure, KSC’s Pad 39B has seen its complex reduced to a “clean pad”, allowing for the arrival of SLS on the Mobile Launcher. The ML is a complex rolling tower – transported to the pad via the modified Crawler Transporter – sporting an array of umbilicals and connections, most of which will be mated with the rocket and Orion spacecraft inside the Vehicle Assembly Building (VAB) High Bay, before rolling out to the pad. Testing of the numerous hardware elements – that will be installed on the ML – is ongoing at the Launch Equipment Test Facility (LETF). This historic test site is located just south of the Operations and Checkout (O&C) Building at the famous spaceport. The first major umbilical to be tested was the Orion Service Module Umbilical (OSMU) last summer. Over recent weeks, engineers have been preparing for the milestone of testing the Core Stage Forward Skirt Umbilical, or CSFSU. 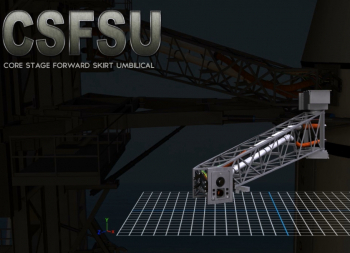 Commodity lines for the CS FS will run through the stabilizer truss of the umbilical arm, with drape commodity lines extending from the arm to CS FS attach location. The umbilical plate will have dimensions of 46 inches by 34 inches. Testing was set to begin last week. However, poor weather moved the start of a test program on the umbilical into this week. Meanwhile, one of the Tail Service Mast units arrived at the LETF on the back of a flatbed truck. 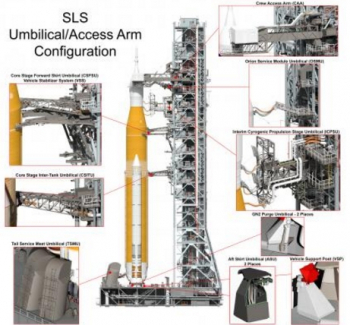 The SLS TSMs will use a pneumatic operated system to detach the umbilical plate from SLS, before retracting the umbilical carrier and closing the door to protect the umbilicals and connections from the exhaust of the SLS launch. This is an advance on the Shuttle TSMs, which used a drop weight for the retraction, released via pyrotechnic devices. Planning teams decided the pyro devices shouldn’t be used for SLS, which led to the decision to go to a pneumatic retraction system alternative. 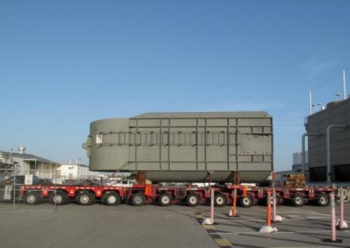 The size of the TSM provides a sign of the upgraded needs of the ML, with each device weighing in at 170,000 pounds. The Shuttle LH2 TSM weighed only 120,000 pounds. The LH2 TSM will be tested at Vehicle Motion Simulator -1 (VMS-1), while the LOX TSM is due in next month, and will go on VMS-2. They will spend the next three months or so hooking the devices to LETF services, ahead of testing in November. According to LETF testing notes (L2), a total of nine umbilical devices are currently in various stages of their testing ahead of being installed on the ML. Meanwhile, next door’s Pad 39A is continuing to be prepared for the debut launch of the SpaceX Falcon Heavy, which is expected to take place early in 2017. The former Shuttle launch complex is technically “pad active”, although work is continuing on items such as the hold down points. 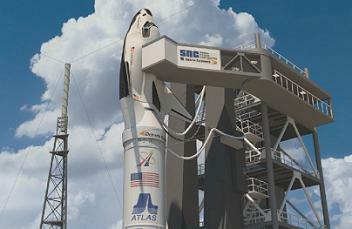 (Images: SNC, Boeing and L2 Dream Chaser, Starliner and SLS Sections).